Gordon Stainforth’s ability to recall this story in such a way as to draw the reader into his thoughts, fears and anxieties is sublime…. One of those rare books that grabs the reader by the heart and soul and barrels you along this amazing adventure. If you ever see a copy, get it and I promise you’ll be as gripped as I was. I think Fiva, from Gordon Stainforth, is hard to beat. The sense of actually being present was intense, and the tension overwhelming…. 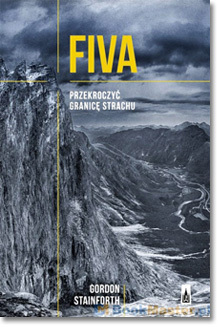 Fiva is definitely the best of climbing books that I have read in the last few years…. 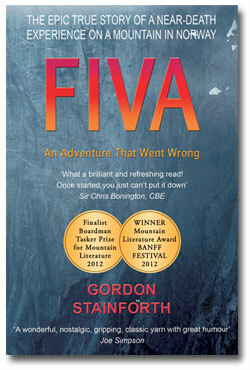 If you want a really good read, look up FIVA from Gordon Stainforth. It is a cracking read, several times over…. I thought FIVA was outstanding…. 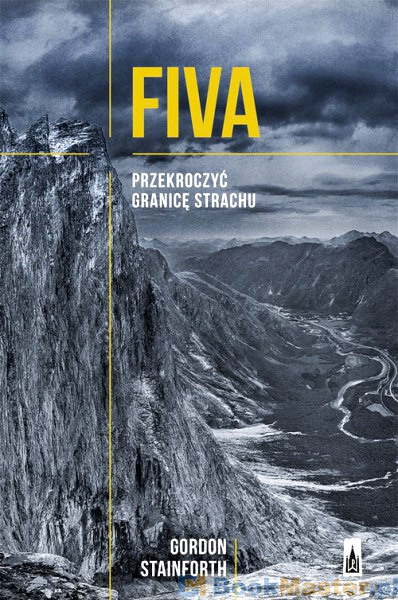 Bloody brilliant book.… Talking of great climbing books, Fiva is another classic, and not often enough mentioned. The best outdoor adventure book I have ever read, bar none … so engrossing and well-written was the story. A future cult classic…. 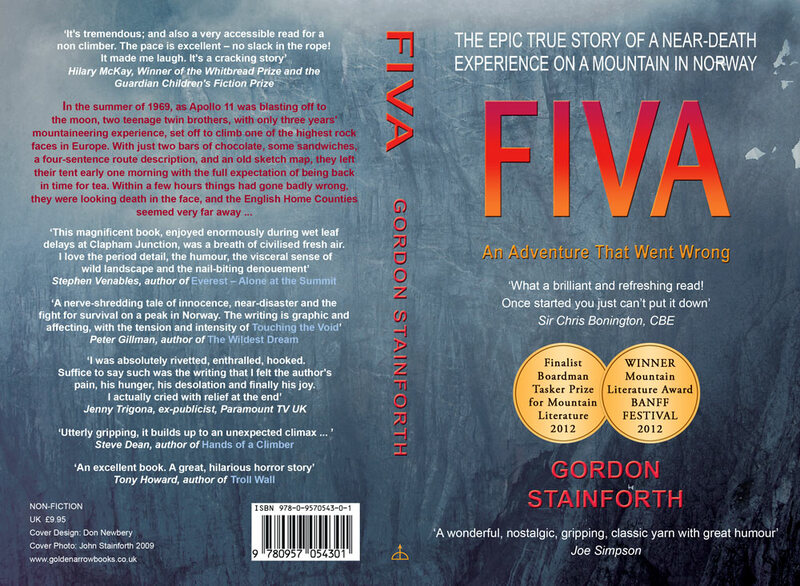 What elevates Fiva is the manner of Gordon Stainforth’s telling of it … Fiva should, as publicists like to say, appeal to climber and non-climber alike. If there were any justice in the publishing world it would be a best seller, eclipsing ‘the Void’. The first person present tense … makes for an extremely technically difficult piece of writing, but if anyone can pull it off Gordon can (given his writing, photography and cinematic credentials) and he does so to spectacular effect…. It remains totally engaging. A superbly crafted story that once read will never be forgotten. Once or twice in a lifetime a mountaineering story crosses the divide between pure mountaineering and human interest … Each single sentence is individually honed and crafted in such a way that the book, like the climb, becomes all consuming. Fiva breaks the modern trend of psycho-analysing everything from “why I climb” to family relationships but in it’s own unique way it answers those questions like no other book … The quality of the writing superb, the pace slowly builds as the story unfolds making it almost impossible to put down. Fiva falls squarely into the ‘sticky book’ category – a book so adhesive that no matter how hard you try, you simply can’t put it down until you’ve finished it…. The pace is flat out from the very first page … a high octane read. Every step of a terrifying, life-changing journey has been chronicled in thrilling and frank fashion in Gordon’s latest book. 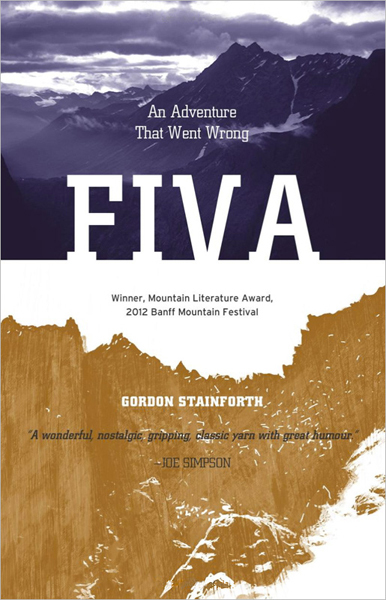 Fiva: An Adventure That Went Wrong … It has already garnered significant praise from reviewers, whether they know about climbing or not; testament to Gordon’s ability to write in an engaging and accessible way. What a story! … As it becomes clear they have bitten off more than they can chew – which is pretty serious hanging 3000 feet above certain death – the fear is palpable…. Things get bad, and then they get worse. By a third of the way through the book, I was absorbed, finishing it in one sitting and worn out by the end..
A page-turner of a book. The story is very well-written and very easy to read, a combination of virtues which placed me in the predicament of not wanting to stop reading but not wanting to reach the end. A fingernail-whittling account of two gauche young adventurers … Well written, perfectly paced and ratchets up the tension by degrees in the manner of the very best works of Mountaineering non-fiction … Certainly one of the better books to emerge from what is generally a crowded and often overworked genre. 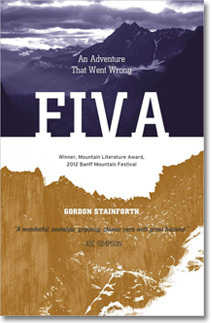 Gordon Stainforth wins best mountain book award at #Banff for his book #Fiva. Truly deserved for an excellent book. Occasionally a story is compelling enough to warrant a wider audience, Touching the Void was one such, and Fiva is certainly another. Its accessibility is made possible by the simple but eloquent writing style, and the open way in which the author relates his feelings, which swing through the entire gamut of human emotions: anxiety, terror, hope, despair, shame, anger and gratitude. It is easy to identify with the story because the human voice is so immediate and so compelling…. It will really have you on the edge of your seat as much as any Hollywood thriller. What a brilliant and refreshing read! Some of our best epics are those early ones when everything is fresh and new, our ambitions great, our experience thin. Gordon has captured all of this in his wonderful little book, that once started you just can’t put down. This magnificent book, enjoyed enormously during wet leaf delays at Clapham Junction and subsequent flight from Gatwick to Venice, was a breath of civilised fresh air. I love the period detail, the humour, the visceral sense of wild landscape and the nail-biting denouement. Absolutely superb and totally gripping from the first few pages until the end. What an adventure! I think it’s a future classic. 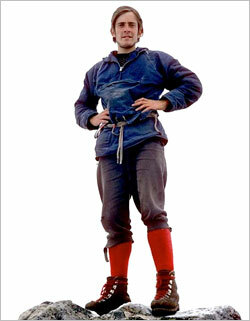 Richard Else, TV producer of The Great Climb, etc. It’s tremendous; and also a very accessible read for a non-climber. The pace is excellent – no slack in the rope! It made me laugh. It’s a cracking story. Hilary McKay Winner of the Whitbread Prize and the Guardian Children’s Fiction Prize. A nerve-shredding tale of innocence, near-disaster and the fight for survival on a peak in Norway. With the tension and intensity of Touching the Void. I was absolutely rivetted, enthralled, hooked. Suffice to say such was the writing that I felt the author’s pain, his hunger, his desolation and finally his joy. I actually cried with relief at the end. Utterly gripping, it builds up to an unexpected climax… Intense and seriously frightening at times, conveying a strong sense of isolation in a truly wild part of Norway. I really, really enjoyed it. It had me hooked from page one and caused me to switch off my bedtime reading light later than usual for several nights. 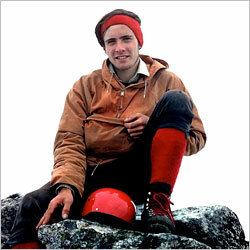 What a great story and I’m left full of admiration for how these two young climbers survived that nightmare. An excellent book. A great, hilarious horror story. Within the title itself: “An adventure that went wrong” the reader is provided with immediate enticement and I was eager to find out how the what, where and how elements of this adventure would unravel. This is gripping stuff that lurches from one near disaster to another and eventually to a fitting climax. This book really is a thoroughly good read and it deserves to become a classic in its genre. Stainforth perfectly captures the sense of youthful adventure of the two brothers, brimful of confidence, climbing Troll Wall. The writing is evocative – you get the sense of Stainforth choosing each word carefully whether describing the ‘damp flanks of the dinosaur’ they are climbing or discussing the limitations of phrases such as ‘curtain of rock’ …. Stainforth expertly keeps the tension in his tale right to the nail-biting conclusion. Great rollicking climbing adventure. For climbers of a certain vintage there is just so much nostalgia … Also highly recommended for non-climbers. A kind of “Touching the Void” which doesn’t take itself too seriously. Amazing read. Gripped me from start to finish. I would definitely recommend this book to climbers and non-climbers as it is a great true story. My wife wants to read it now…….. The twins – John (top), Gordon (bottom) – on the summit of Store Vengetind (1852m), a fortnight after their epic on the Fiva Route in July 1969.